UF Health Springhill's primary care building, the second phase of an ambitious multi-phased project that is bringing outpatient services to a new 40-acre healthcare campus in northwest Gainesville, has broken ground. The new 72,000-square-foot, three-story building will focus on primary care services including clinics for family medicine, internal medicine, pain medicine, child and adolescent psychiatry and medical psychology, a flexible "condo clinic" for future use, a retail pharmacy, and a blood draw area. These primary care practices bolster the project's first phase, a 108,000-square-foot multi-specialty clinic that houses the University of Florida Physicians' specialty practices in cardiology, adult psychiatry, dermatology, surgery, women's health, and diagnostic imaging. 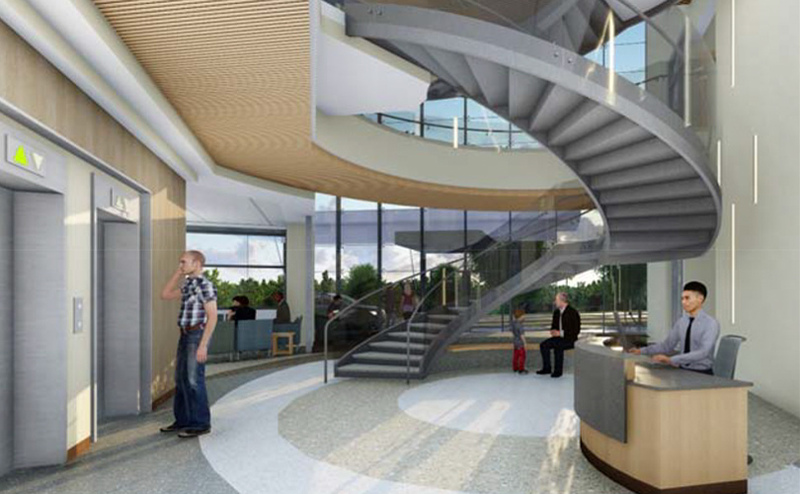 The primary care building space plan maximizes efficiency and flexibility. Waiting areas will be smaller in response to shorter wait times. The team-based provider work area creates an environment to support interdisciplinary work between physicians, residents, extenders and nurses for more cohesive patient care. Similar to the Phase 1 clinic, the exam room sizing and configuration are modular to allow flexibility for future uses, while providing ample space for standard amenities. The new retail pharmacy and expanded blood draw, as well as the diagnostic imaging services in the phase 1 building, allow patients to fill all their health treatment needs without leaving the campus. For both phases, Flad has provided site master planning, medical programming and architectural, structural engineering, landscape, and interior design services. The new facility is set to open in August 2018.